The Seventeenth Judicial District Commission on Judicial Performance unanimously recommends that Judge Robert S. Doyle BE RETAINED. 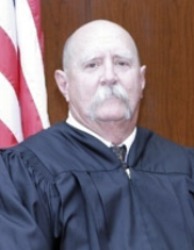 Judge Doyle, an Adams County Court Judge in the Seventeenth Judicial District, was appointed to the County Court bench on July 14, 2004. Prior to his appointment, he served as a Deputy District Attorney in the Seventeenth Judicial District for 19 years and as an appointed magistrate in the same district for 4 years. He graduated from the University of Colorado with a Bachelor of Arts in Sociology in 1973, and obtained his Juris Doctor in 1980 from the same institution. Judge Doyle’s case load currently is 100% criminal. In arriving at their recommendation, Commission members interviewed Judge Doyle after reviewing survey results provided by lawyers, parties, and other individuals who appeared in front of Judge Doyle or otherwise observed him in court. The Commission members also reviewed Judge Doyle’s self-evaluation, observed him in court, and reviewed a number of decisions rendered by the judge. During this election cycle, Judge Doyle’s survey results from attorneys and non-attorneys revealed ratings that were right at the statewide average among all county judges standing for retention. Of attorneys responding to the survey, 83% recommended to retain, 12% not to retain, and 4% made no recommendation regarding retention. Of non-attorneys responding to the survey, 93% recommended to retain, 2% not to retain, and 5% made no recommendation regarding retention. (These percentages may not total 100% due to rounding). The Commission believes Judge Doyle keeps up to date on the law and applies it fairly and uniformly. Judge Doyle runs a relaxed court room which sometimes may border on the chaotic. Commission members were concerned about the level of sometimes distracting activity in the courtroom as it related to the decorum and dignity of the court and the perception of the Judge’s control. When brought to Judge Doyle’s attention, he agreed that even with the heavy volume of cases going through his division, efforts could and would be made to limit the amount of distraction in the court room when he was on the bench. The Commission, based on its review, unanimously recommends that Judge Robert S. Doyle BE RETAINED.